My testing continues with my Henry carbine in 45 Colt and I have found out that it likes the Sierra Bullets #8830 300gr Sports Master JSP. I was hoping to catch one and show what kind of expansion it gives and it took some doing but I finally did. The bullet to the left weighs 288.84 grains and the fragments weigh in at 11.04 grains for a total of 299.88 grains from a 300gr start. This was made with an impact velocity of 1,604fps and it went through 54 inches of water just to bounce off of the large blue barrel I had placed behind everything, just in case (and thank goodness I did). With this kind of performance, it should break bones easily and still keep going. It could easily be put to other applications where maximum penetration is required. This velocity and likely more could be better obtained from a 454 Casull and Big Horn Armory just happens to make a Model 90A . The accuracy from this bullet is fantastic as it gave me a 0.76” center to center group size with a lighter charge (slower velocity) from my firearm. One thing I noticed when crimping, it doesn’t give in as much as our 240gr does so the crimp looks and feels different between the two. I’ll be the one at the range with the kids sporting large smiles screaming “Shoot another one!” when a refilled liter or 2 liter bottle blows up. Till next time, enjoy your shooting and be safe. Editor’s Note: Due to the fact that this is a rifle, this bullet had no difficulties traveling from the case to the end of the barrel. A revolver having a gap between the cylinder and forcing cone can be hard on this and our other bullet so a velocity cap is put on both. 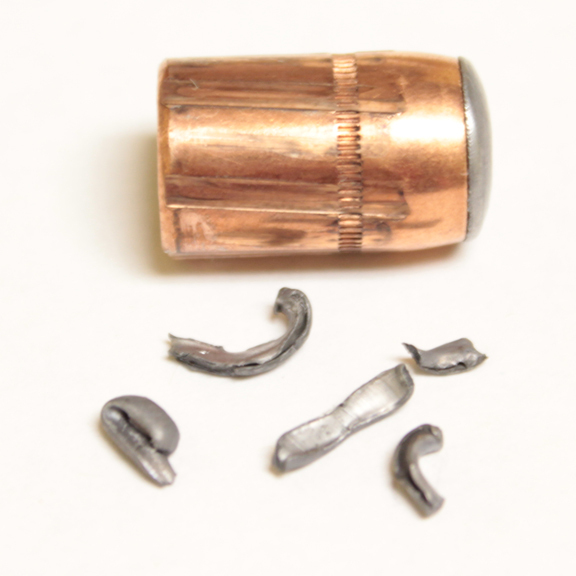 Keep our 300gr bullet under 1,550fps and our 240gr under 1,400fps from a revolver style firearm. This entry was posted in Uncategorized and tagged 45 Colt, Colt, colt ammo, colt ammunition, handgun bullets, pistol bullets, shooting, Sportsmaster, SportsMaster bullets. Bookmark the permalink. Excellent. Thanks for testing this bad boy. Looking forward to loading them in 45 Colt and 454 Casull for my 460 S&W magnum revolver. No appreciable expansion but it’s already a big diameter hole maker😊. Thanks for sharing. I have a 5 shot .45 and use the bullets exclusively. 1580 fps out of 7 1/2 barrel . These are tack drivers. Simply love this bullet.